Cyclists turning right out of Upper Harbour Dr have to merge with east bound traffic travelling at 70km/h traffic the Albany Highway intersection. To do this safely cyclists need to be able to see approaching traffic. 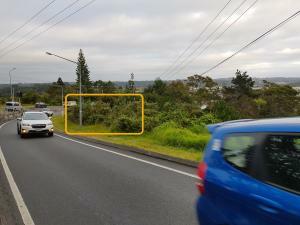 Unfortunately all the gorse, pine and wattle trees now growing on the vacant area of land on the inside of the sweeping curve in Albany Highway severely restricts the visibility of this high speed traffic. This issue was last reported and fixed in 2010 but the scrub has grown back. Can these weed species please be removed again?